gWorkspace is a cloud-based storage system we developed here at greenspaceLive. It allows multi-disciplined users to work collaboratively on building projects. We see gWorkspace as the central hub for a project, with users sharing images, floor plans, survey reports, simulation analysis and more. We recently partnered with Hebridean Housing Partnership (HHP) as part of a study looking at energy efficient housing and the reduction of fuel poverty in the Western Isles. gWorkspace was the perfect tool for this, it held all the project data and provided a shared area for the participants to upload files and ensure that all parties were made aware of additions as the project progressed. Storing this data on the cloud means it can be accessed at any time, from anywhere in the world. Once the study is completed it allows for future analysis to be undertaken by HHP on different house types as technologies improve and become more cost effective. gWorkspace comes integrated with all of our products, your workspace can be viewed from your desktop, tablet or smartphone and it even allows you to share through social media applications like Facebook and LinkedIn. We want to connect all participants of a project and make the whole process that little bit easier. Sign up for a free 30-day trial today and see for yourself! “[Cloud computing is] the best thing for small business since the creation of the stapler. Cloud computing is a playing field leveler; it gives small businesses access to technologies that previously were out of their reach and lets small businesses compete with both other small businesses and larger ones. Storing files and documents on the cloud is great, it means that you can access your files from anywhere regardless of what computer or device you are on. But what makes it even better is the ability to share your projects and documents with others, such as your colleagues, friends, and clients. We’ve tried to make sharing as easy as possible in gWorkspace by building it right into the core of the application. gWorkspace allows you to share projects in three ways: over email, Facebook, and LinkedIn. In this blog post, I’d like to show you how to do this for each. In order to share a project from gWorkspace, you need to either press the share button inside your project view, or select the dropdown menu from the project icon and select “share”. The location of the share button is shown below. After the share button is pressed, you should then see dialog asking you to select the method you’d like to use to share the project. Options available are email, Facebook, or LinkedIn. 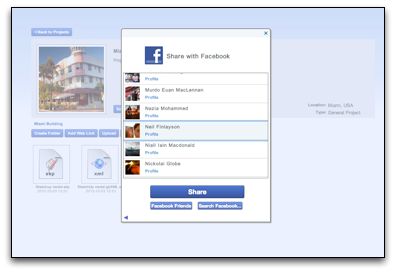 The screenshot below shows the share dialog. 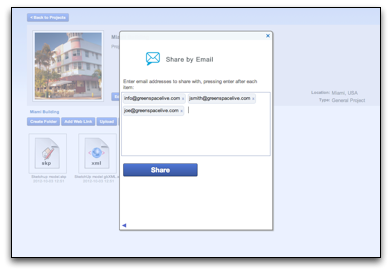 Sharing using email simply involves typing in the email addresses of people you’d like to share the project with. You can type as many email addresses as you want into the input box, press the “Share” button, and an invite will be sent to each address. Invites will be sent to each recipient including a link pointing back to your gWorkspace project. When the recipient clicks the link they will be asked to either login or register with GreenspaceLive. Once they have done so they will be able to access your project. 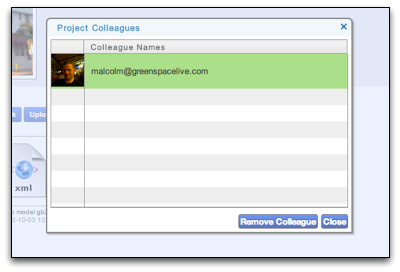 gWorkspace now includes the ability to share your project among your Facebook contacts. Doing so is simple. Select the “Share with Facebook” option on the share dialog, select the contact you’d like to share with from the list of your facebook friends, and press “Share”. The first time you use this functionality, you will be asked to authenticate with your Facebook account by clicking on a Web link. Clicking the link will take you to the Facebook website, where you will be asked to grant GreenspaceLive permission to access your contact list. Authorising this will then bring you back to GreenspaceLive, where you can continue sharing your project. Facebook authentication only needs to be done once, from then on you will have direct access to your facebook Friends from gWorkspace. 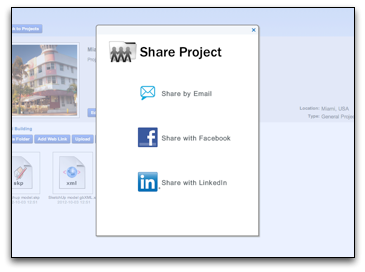 When you share a project with a Facebook contact, the contact will be notified of the share via a Facebook message. This message will contain a link back to your project. Once the user clicks on the link, they will be asked to log in or register with GreenspaceLive, once they have done so they will be able to access your project in gWorkspace. As well as being able to access your own Facebook friends, you can also search Facebook for others to share with. To do this, just press the “Search Facebook” button and type in the name of the person you’d like to share with. 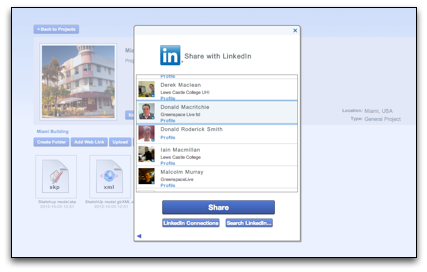 The first time you use the LinkedIn share functionality, you will have authenticate your account with LinkedIn. This is very similar to the process for Facebook. To authenticate with LinkedIn, you simply click on the “Authenticate” link which takes you away to the LinkedIn website. 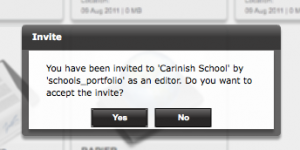 LinkedIn will then ask you to verify that GreenspaceLive can have access to your LinkedIn contact. Approving this will then take you back to GreenspaceLive, where you can continue sharing your project. When you send an invitation to a LinkedIn contact, a message will be sent to them using LinkedIn with a link back to your shared project. Clicking this link will take the user to GreenspaceLive where they will be asked to either login or register. Doing so will then allow them to access gWorkspace where they will be able to access your project. Just as with the Facebook share functionality, you can also search LinkedIn for people who are not on your contact list. Doing this using LinkedIn is particularly powerful, as you can also search by company name. For example, try searching for GreenspaceLive. To search LinkedIn press the “Search LinkedIn” button. 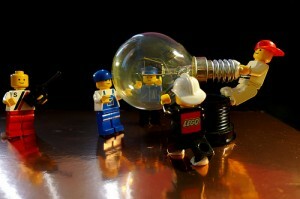 As the owner of a project, you alone have the ability to add or remove other contacts to your projects. 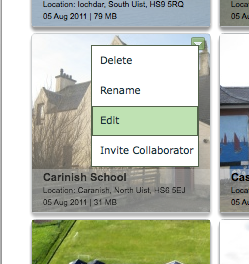 You can add people as detailed above or remove them using the Colleagues dialog, which can be accessed by pressing the “View Colleagues” button in a shared project. Contacts that you invite into projects will be able to add and remove content from the project, but will not be able to share the project with other people. We are working on adding more granular control of what contacts can and can’t do and this should appear in a a future version of gWorkspace. Contacts can also be messaged using gWorkspace’s built in messaging capabilities. And there you have it, sharing in gWorkspace! We’d love to hear how you get on with sharing your projects, and how you’re using this functionality. Keep an eye on our blog for more posts highlighting some of the new functionality in gWorkspace, our website, and other tools. Following the relaunch of our website, and gWorkspace, we are starting a series of blog posts highlighting some of the new features and functionality in the revamped gWorkspace. The new gWorkspace has been completely rebuilt, and designed to be compatible with as many browsers as possible using HTML and AJAX for its user interface. This means that gWorkspace now works on most mobile devices as well as on your desktop. It also means that gWorkspace is now far more responsive than the older Flash based version, and has a whole bunch of new features that make gWorkspace easier to use than ever! One feature I’d like to highlight in this blog post is drag and drop file uploading to gWorkspace. Web based cloud storage is great, you can access your files from anywhere, share them with colleagues etc. However, actually getting your files onto the cloud can be a pain – particularly if you need to do it one file at a time. We’ve tried to make this a bit easier by introducing drag and drop file uploading. To use this, you simply select all the files you want to upload from your desktop, drag them into gWorkspace (which should automatically highlight in green where you need to drop the files) and drop them in place. The upload process will then begin and your files will be sent to gWorkspace. Once files are uploaded into gWorkspace, you can drag and select multiple files to carry out operations such as moving, copying, and deleting files. Check out the video below to see drag and drop in action in gWorkspace. We really hope this helps make gWorkpace easier to use, and we’d love to hear your feedback on drag and drop as well as all our other new changes! This week, I thought I’d introduce some new functionality we’ve added to gModeller – the ability to synchronise gModeller for Google SketchUp with gWorkspace. 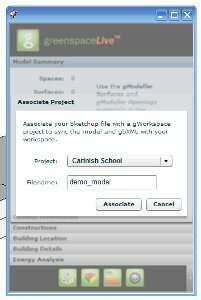 By synchronising a gModeller model with gWorkspace, a copy of the SketchUp file, and associated gbXML file, is backed up to gWorkspace – from where it can be accessed and shared anywhere. Synchronisation with gWorkspace happens every time SketchUp autosaves the model, taking away all the hassle of uploading your file. Synchronisation is a ‘set and forget’ operation that ensures your model is always backed up to the cloud!! Turn on Versioning in gWorkspace, and you have a historical record of each change that was carried out throughout the development of your model. This also means that if you make a mistake, or need to go back on some changes, then you simply choose the appropriate version, bring it back, and carry on working! 1. Within the gModeller user interface, press the “Associate with Workspace” Button. 2. 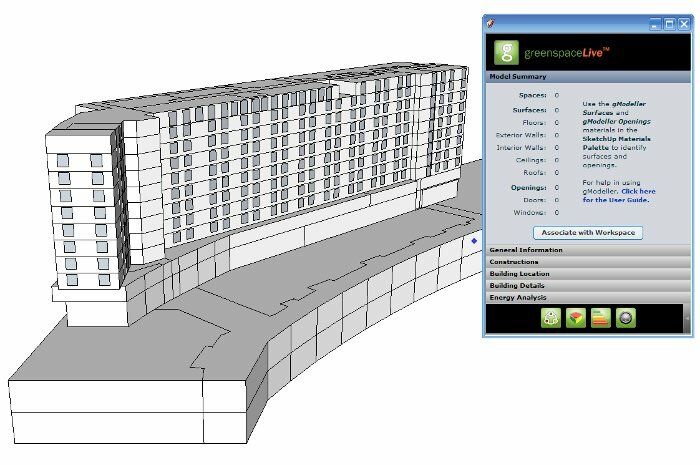 Select the project that you want the model to be associated with, and provide a name for the model. 3. Press “Associate”, and you’re done. Your model will now be synchronised with, and available in, gWorkspace! We’d love to hear how you get on with synchronisation between gModeller and gWorkspace, and how you’re using Google SketchUp on the Cloud. Also worth noting is that this will work with any SketchUp model, not just buildings – so if you want to backup, version, and share your SketchUp models then gModeller and gWorkspace are for you!!! gWorkspace Versioning – Never Lose A File Again! One of the difficulties of working with files, especially when collaborating with others if to keep track of the different versions of a file. This is needed if you want to undo a recent change, or compare previous versions of a file. With the latest gWorkspace, you can now enable versioning on any file which will help you manage the version history, and means you never lose data as files are updated and changed. 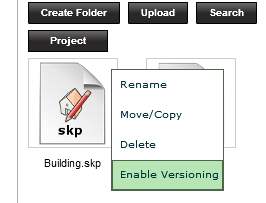 Versioning can be enabled for any file by clicking on its drop-down menu and selecting ‘Enable Versioning’. With versioning enabled, any files with the same name uploaded to the folder will be saved as a new version of that file. To see a list of all versions of a file, select its drop-down menu and select ‘View Versions’. 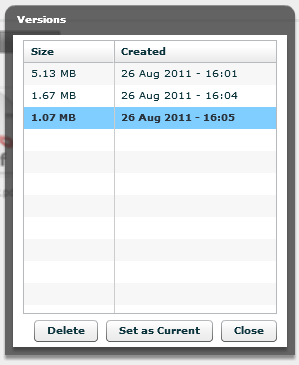 This will display a pop-up showing the versions, and allows you to delete any version, or change the current version (the version that you get when you download the file). If you no longer want versioning on the file, simply choose ‘Disable Versioning’ instead. This deletes all versions except for the current one, removing the versioning features for that file. We hope to expand on the version functionality in future versions of gWorkspace. We’d love to hear what you think of versioning in gWorkspace, and what you’re using it for. Sharing is am important part of day to day life – people rarely work in isolation, particularly when it comes to building projects where we usually see people from many disciplines working together to design, construct, and manage buildings – often with amazing levels of complexity. However, in the paper based world this can be difficult. Versions of documents can get mixed up, Engineers may not have the latest versions of an architect’s plans, etc. etc. We believe that gWorkspace can help with this. Using gWorkspace, a team of people (not just building professionals!) can organise documents, files, and information relevant to them and then share with the rest of the team! Today, I thought that I would show how simple it is to begin sharing with gWorkspace in 3 easy steps. The first step in collaborating with gWorkspace is to build your network of contacts. To do this, simply invite others to join you at GreenspaceLive by using our web based invitation form to establish a connection! After you’ve shared a file with a contact, they will have to accept the share before it is finalised. When a project is shared with a user, they will see a popup window asking them to confirm the connection. That’s it! the project is now shared, and collaboration can begin! Remember that you always have full control of your project, if at any time you want to unshare a project you can easily do this by going to the project’s drop down menu. Unsharing is as easy as sharing – but not as much fun! For more information on how to use gWorkspace, and to find out what else you can do with it, please visit our comprehensive gWorkspace User Guide. Let us know how you get on with gWorkspace, we’d love to hear what you are doing with it – and what you would like to see in gWorkspace. Also, keep an eye on this blog for more updates on gWorkspace, gModeller and the GreenspaceLive software suite! Today, I thought I’d talk a little more about gWorkspace, which now acts as a foundation for your project management. gWorkspace has changed drastically from its Box.net origins, onto our own faster, stronger platform, with a really cool interface for your project management. Now, when you’re working on a project, you can create the building in gWorkspace and all our updated tools now link straight into them. gEnergy runs now “attach” onto the project, so you can view them within gWorkspace remotely and when you share the project, you also share the runs, which is something we weren’t able to do before. gModeller has access into gWorkspace too, allowing you to upload and download from the Sketch-Up plug-in. Sharing is now a massive part of gWorkspace, you can add and remove users from your portfolio projects. Sharing empowers you to work remotely with your colleagues or even other users of greenspaceLive. Work on plans, models, or energy runs and use the built in messenger to update each other while you do it. gWorkspace is free up to 1GB or 9 projects, and I would strongly recommend giving it a try. A tutorial is available here to teach you how to use it. Don’t forget to update your gModeller and gEnergy installs to make sure that they interface with the workspace now!